The Chairman & CEO of OgilvyOne Worldwide and career advisor extraordinaire, Brian Fetherstonhaugh, outlines the three stages of a long, successful work life and offers guidance to plan ahead and get the most out of each phase. The world of careers is vastly different than it was just five years ago--more choices, more competition, and relentless change in how we define work-life. It can be difficult to understand our options and plan for a prosperous future. Where can you go for answers? Colleges may teach us academic and technical skills, and there are places to look for tips on how to write a resume or prep for a job interview. But is it enough? Brian Fetherstonhaugh, CEO of OgilvyOne Worldwide, understands this dilemma and how to navigate it. He believes we need more than tactics--we need robust, road-tested strategies that combine old-school wisdom with new-school context so that we can flourish in the new professional reality. In The Long View, Fetherstonhaugh shows us the three distinct but interconnected stages of a career, and how we build 'fuel' at every step along the way to create long-term success. The Long View teaches us new ways of finding jobs, new methods to build careers that last, and a new definition of "work" that embraces life-satisfaction and happiness. The Long View offers highly practical exercises that challenge you to rethink how to assess your skills, invest your time and expand your personal network, and provides a framework for facing tough job decisions. 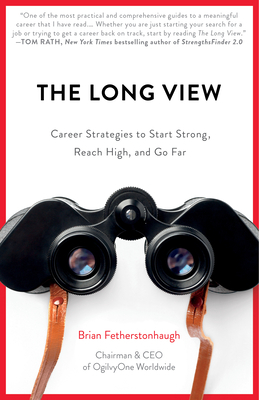 With insights drawn from interviews with a variety of professionals--who share both success stories and cautionary tales--The Long View will help you establish your own path for overcoming obstacles and making the best choices for a long, accomplished, and rewarding career.